Masquerades are elegant, fun, and full of mystery. Celebrate these sophisticated affairs with a cake or cupcakes themed after such a beautiful night. Using a variety of cake decorating techniques, create stunning desserts to match a fashionable party. Masks are a crucial part of the masquerade experience, so build a layer cake around that visual theme. This cake incorporates both buttercream decorating and fondant decorating and is a good project for an intermediate decorator. Cut the domed tops of the cakes off so they are flat on top. Cut each cake in half through the middle to create two layers from each cake. Place one 8-inch round cake layer on the cake round. Cover the top of it in a layer of frosting and then place the second cake on top of it. Repeat with all four cake layers. Apply a crumb coat to the 8-inch cake. Off to the side, place one 6-inch round cake layer on the 6" cake board. Cover the top of it in a layer of frosting and then place the second cake on top of it. Repeat with all four cake layers. Apply a crumb coat to the 6-inch cake. Place a few spoonfuls of the white buttercream into the icing bag with the small round tip. In a small bowl, mix the remaining buttercream with a few drops of the violet icing color until the color is uniform throughout. Fill the bag with the star tip with this violet icing. Starting at the bottom of the 8-inch layered cake, create swirls with the icing, about 1-inch across each. Don't leave an opening in the middle so that the crumb coat on the cake is hidden. Instead, touch each swirl snugly up against the one next to it, going all the way around the bottom. Now create a second row of the swirls just above the first. Repeat until the sides of the cake are all covered. Leave the top of the cake bare for now. Put on the gloves. Use about half of the fondant in the package and dye it black with several drops of the icing color, mixing it by hand in a small bowl by folding the fondant over until the color is distributed. Dust the work space with some powdered sugar. Roll the fondant out into a large circle until it is a little less than ¼-inch thick. Use the rolling pin to pick up the fondant by laying it at one end of the circle and folding a small edge of the fondant circle over the top of the pin, then rolling the fondant up by wrapping it around the pin. Move it over the 6-inch cake and carefully unroll it over top. Gently smooth the fondant over the cake, carefully pushing air bubbles down and out of it. It stretches slightly, but be sure not to pull it! Just gently smooth it with your gloved hands. Use a small paring knife to cut the extra away from the bottom of the cake - but don't cut so close that the crumb coat or cake show. Using the spiked wheel tool, roll lines at a 45-degree angle across the sides of the cake, forming diamond shapes. Carefully transfer the 6-inch cake on to the top of the 8-inch cake and place it dead center. Using a few dollops of white buttercream as glue, attach the jeweled embellishment around the bottom edge of the 6-inch cake. Using the remaining violet icing, fill in the top of the 8-inch cake with swirls. With the remaining white buttercream, glue the edible pearls at every intersection of the diamond shapes on the 6-inch cake. Also stick the pearls onto the 8-inch cake, placing one at the center of every swirl. Stick the feathers into the top of the 6-inch cake to create a tall display. Place one mask on top of the cake and one at the side. Masquerades are opulent affairs. 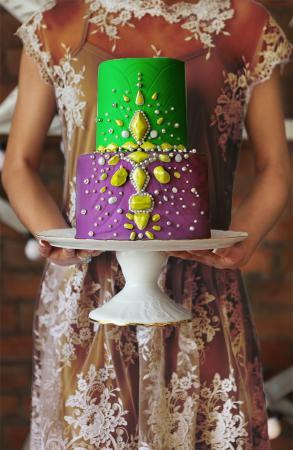 Salute that theme of decadence with a cake that looks simple yet wears a collection of fondant jewels that look fancy. Using both buttercream decorating and some hand-sculpting of fondant, this cake is good for a beginner or intermediate decorator. Off to the side, put one 6-inch round cake layer on the 6" round cake board. Cover the top of it in a layer of frosting and then place the second cake on top of it. Repeat with all four cake layers. Split the buttercream in half. Tint one Leaf Green and the other Violet until you reach the vibrancy desired. Frost the 6-inch cake with Leaf Green buttercream. Frost the 8-inch cake with Violet buttercream. Carefully transfer the 6-inch cake onto the top center of the 8-inch cake. Using the bamboo skewer or toothpick, draw shallow lines in the front of the cakes in gently curved shapes, using the photograph as a guide. Put on the gloves. Use about half of the fondant in the package and dye it Golden Yellow with one to two drops of the icing color. Also add 2 teaspoons of the edible pearl lustre dust to the mix. Mix the pearl dust and color in by hand in a small bowl by folding the fondant over and over until the color and glitter is distributed evenly. Using the fondant, hand sculpt 18 small diamonds 1-inch long, three large diamonds 2 inches long, three large rectangular gems 3 inches long, and assorted small teardrops and dots less than ½-inch long each. Using the buttercream frosting in the icing bag, stick each of the small diamonds, end to end, around the bottom edge of the 6-inch cake. Using the photograph as a guide, place the large diamonds and rectangles with a small dot of buttercream on their backs. Ring the outer edges of the large diamonds and rectangles with the edible pearls, sticking them in place with small dots of buttercream. With buttercream as glue, place the rest of the small fondant shapes and some of the edible pearls along and around the curved lines that were drawn on the cake, using the photograph as inspiration. If the options above don't appeal to you, try one of these festive ideas instead. Frost cupcakes in the theme colors of the party and add some edible mask decorations to the top of each one, adding a few edible pearls on top as well. Using the same "quilted" fondant technique from the top tier of the Masquerade Layer Cake, decorate a two- or three-tiered cake in the colors of the party. With several colors of royal icing, make a variety of small mardi gras masks on a sheet of parchment paper. Use these to create a border around the bottom of a buttercream iced cake. Using the same buttercream "swirl" technique from the bottom tier of the Masquerade Layer Cake, make an "ombre" cake with several differing shades of the same icing color. Start with the darkest shade at the bottom of the cake and, each row of swirls, use the next lighter shade. Top the cake with a matching color mask and some feathers. Any of these sweet treats would be a great addition to a party with a masked ball theme. 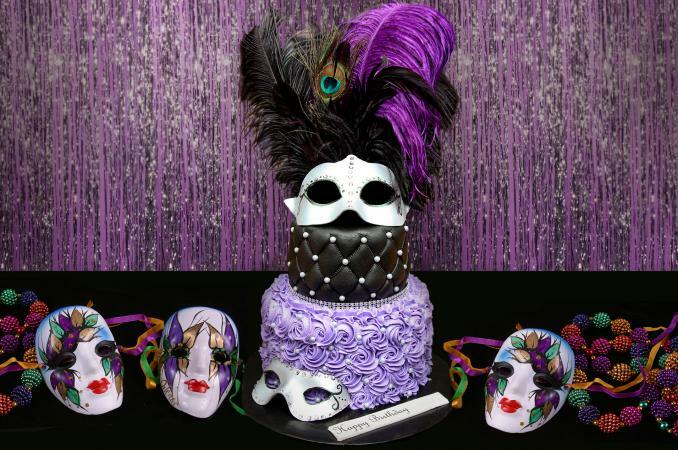 Perfect for Mardi Gras or other elegant occasion, these masquerade cakes and cupcakes will really make a statement.